There is no doubt that when you enter a home with hardwood flooring it makes an impression. 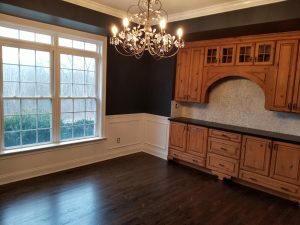 The perks of having elegant hardwood floors in your home are endless and there are professional flooring companies that can make your home-decor dreams come to fruition. Hardwood floors are easy to clean and last for decades if maintained properly. A crucial part of maintenance for your floors is applying a finish. A coat of finish will protect your floors from dirt seeping into the porous wood and will also prevent the daily wear and tear from causing permanent damage. Hardwood flooring is always in style and if you decide to sell your home, the value will be much higher and will attract more potential buyers. Any style of home, no matter how grand or simple, will benefit from the classic look of rich hardwood floors. If you are building a brand-new home, you have the freedom to choose what kind of wood, grain and style of flooring will best match your house’s design. Older homes look better with hardwood flooring that matches the time in which they were built. For newer homes, you can work with professional contractors to create whatever look you desire. If you already have hardwood floors in your home and want to refurbish them to their original brilliance, call a professional flooring company to schedule a consultation. Some companies will meet for a first consultation for free. In some cases, the floors will be sanded down if the damage is significant. The sanding buffs out damaged spots and stains and then a layer of finish will be applied to protect the hardwood flooring from future damage. Consulting with a professional flooring or remodeling company is the safest way to ensure your floors are taken care of properly and allows you the peace of mind that your home will not be damaged in the process. One thing is certain; homes with hardwood flooring have a timeless elegance that will never go out of style.